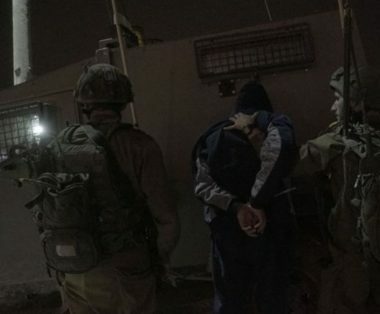 Israeli soldiers invaded, on Tuesday at dawn, many homes in Hebron city, in addition to Halhoul, Yatta and Doura towns, in the southern part of the occupied West Bank, abducted three Palestinians, and confiscated a car. Media sources in Hebron said the soldiers invaded and ransacked homes belonging to the father, grandfather and uncles of Bassel Bassam Seder, 17, who was killed by the Israeli army on October 14, 2015. The soldiers also confiscated a car owned by Ragheb Seder, after invading and searching his home. In addition, the soldiers invaded Halhoul nearby city, and violently searched many homes, including the home of Yousef Zama’ra, the father of Hamza Zama’ra, 19, who was killed by the army on February 06, 2018. In addition, the soldiers abducted a child, identified as Mohammad Khaled Da’dara, after invading his home and searching it, in addition to summoning two Palestinians for interrogation. The army also distributed leaflets warning further invasions and collective punishment should protests continue in the area. Furthermore, the soldiers abducted Hazem Hussein Sharwana from his home in Doura town, and summoned for interrogation a journalist, identified as Mos’ab Shawar, in addition to Esmat al-Adra, from Yatta.